Please make sure you buy the right edition! 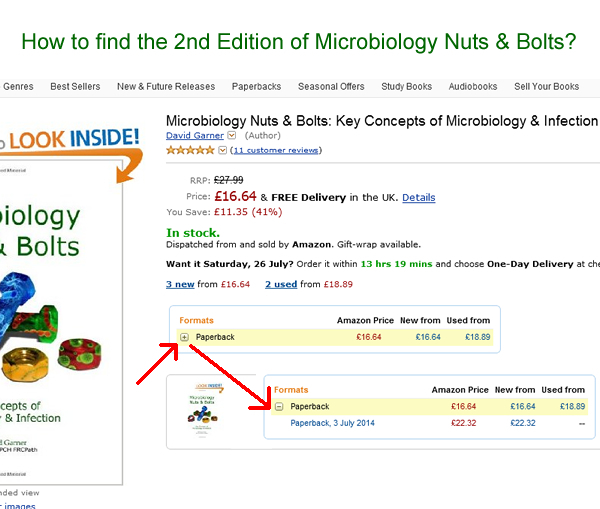 Unfortunately in order to preserve our status as "No1 Best Seller in Microbiology and Virology", the 1st and 2nd Editions have to be listed together as the 1st Edition. However this means to find the 2nd Edition you must expand the +sign by paperback in the formats box and select "3 July 2014" (see screenshot below). The 2nd edition states 2nd Edition on the cover, if you feel you were duped into ordering the wrong edition...we recommend you inform Amazon and get your copy swapped. NB If we list the 2nd Edition separately you'd never find it...it's listed after vitamins?!*? !